Boticca is an ecommerce startup launched this week by former Accel Partners associate Avid Larizadeh and Kiyan Foroughi as a unique marketplace for original jewelry and other accessories. In the same conceptual online accessory space as Gemvara and Jewelmint, what sets Boticca apart from most ecommerce sites is its design, curation, content and community features. 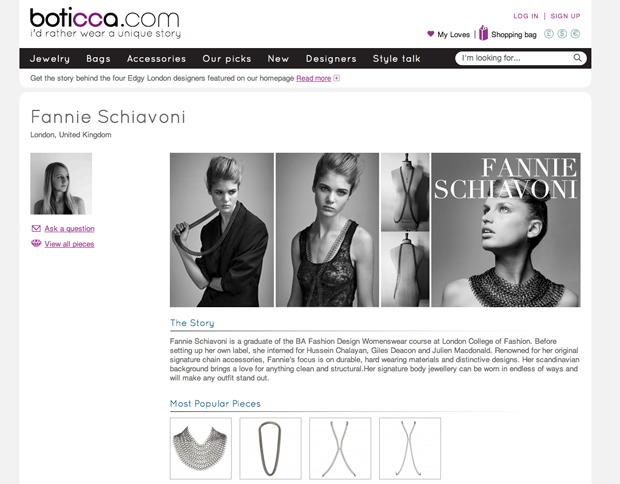 In fact Boticca’s website is beautiful, simple to navigate and user friendly. Aside from sorting by “Jewelry,” “Bags” and “Accessories” as well as staff picks, you can also search and scroll through individual designer profiles through the “Designers” page. Each designer profile allows you to read background information and actually interact with the designers, hence Boticca’s tagline “I’d rather wear a unique story.” The profiles also show the most popular pieces and commentary for each design. The Boticca team including Chiara Cirella, formerly a designer for the Italian National Opera, searches internationally for its unusual designs and has already amassed a community of over 130 designers from 40 countries. Would-be designers can apply through the site and need to uphold the “Designer Charter” in order to ensure quality of both product and customer service. Based in London, Boticca is currently bootstrapped as well as funded by angel investors from Europe and the US. Aside from getting celebrity traction from the likes of Lady Gaga and others, Boticca is also in the running for TechCrunch’s The Europas European startup competition. You can take a look at other TechCrunch Europe Awards finalists here.